Anna Julia Cooper was a prominent African American scholar and a strong supporter of suffrage through her teaching, writings and speeches. She was born to house slave Hannah Stanley Haywood in Raleigh, NC. She studied on a scholarship and taught at Saint Augustine’s Normal School and Collegiate Institute in Raleigh. There she met George A. C. Cooper whom she later married. After his death after two years of marriage, she earned a B.A. and M.A. from Oberlin College, studied at Columbia University, and at 67 years of age received her Ph.D. from the Sorbonne in Paris. She was an educator most of her life, instructing in Latin and Mathematics at the predecessor of Dunbar High School (M Street High School) in Washington D.C. She was the author of A Voice from the South, cited as the first work of an African-American feminist. It was published in 1892, and later by Oxford University Press. Cooper lived to 105 years of age. 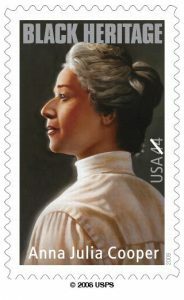 In 2009, the US Postal Service issued a stamp in her honor, also in 2009 the private tuition-free Anna Julia Cooper Episcopal School was founded in historic Church Hill area in Richmond Virginia. Sources: (1) Excerpts taken from Divided Sisters: Bridging the Gap Between Black and White Women by Midge Wilson & Kathy Russell, Anchor, 1996—and PBS.org, (2) Anna Julia Cooper, in May Wright Sewell, ed., The World’s Congress of Representative Women (Chicago: Rand, McNally, 1894), pp. 711-15. http:// www.wesleyan.edu/mlk/posters/suffrage.html viewed on 2 May 2015; http://www.blackpast.org/aah/cooper-anna-julia-haywood-1858-1964 viewed on May 2, 2015.